Some athletes live their lives in a loud obvious way. They make sure everyone knows they’re around and never miss an opportunity to publicize their accomplishments Other athletes conduct themselves in more quiet, private ways, but their generosity makes a loud resounding noise. Paul Martin is such an athlete. I was recently made aware of Martin’s involvement with Defending The Blue Line by Rick Erredge, Executive Vice President for the charity. 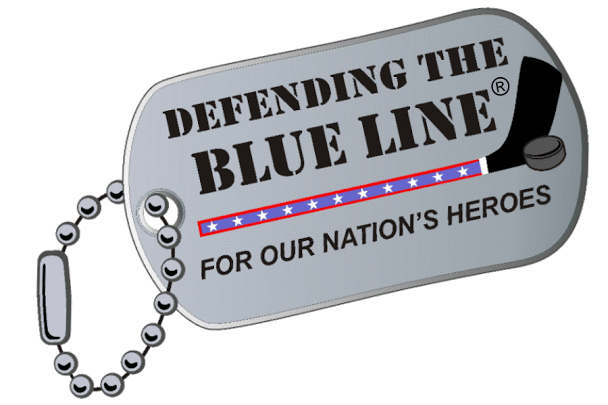 Defending The Blue Line actively works to ensure that children of military members are afforded every opportunity to participate in the game of hockey. Through Rick and his staff, I learned of Martin’s involvement with the group and how he reached out to a Marine Corps family. The Pittsburgh Penguins, as an organization, are active in supporting DTBL. In 2012, the Penguins provided 2 military kids the opportunity to join their hockey school free of charge and on September 21, 2013 the Penguins donated 250 tickets to DTBL military families. The Penguins are also donating tickets to their 2013-2014 home games (Interested military families may apply for those tickets here). It stands to reason that when an organization sets the example of charitable giving, it’s members will follow. Paul Martin has been a supporter of DTBL since 2012. Since then, Paul has generously given of his time as well as monetarily. Martin, a Minnesota native, has been active in NHL Players Charity games in his home state where proceeds from the game as well as autograph sessions benefit the charity and the military children they support. This past October, Martin hosted a military family who was experiencing a difficult time in their life. Jeremy Frantz, a U.S. Marine, was home on emergency leave due to the death of his father, William Frantz, a former Marine. Martin bought tickets to the Pens/Canucks game for the Frantz family but his generosity didn’t stop there. He also spent time with Jeremy, Jennifer and their kids Nick, Ben, & Kate. 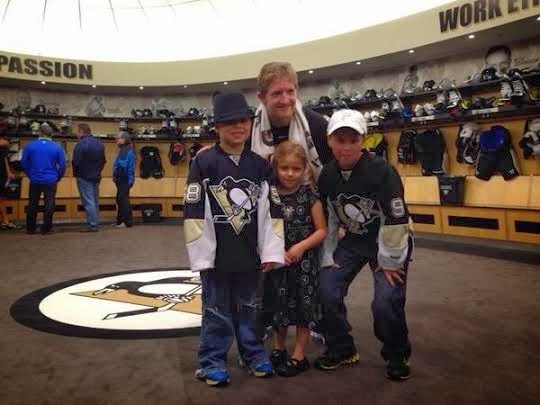 He gave them the Consol Energy Center grand tour, even stopping in the Pens’ dressing room for pictures. When you serve the families of those who serve our nation, you serve your nation as well. Paul Martin certainly exemplifies that statement. For the next two weeks he, along with other members of the Penguins, are serving their nations in another way; as Olympic athletes. Martin and Brooks Orpik will likely be a defensive pairing in Sochi under their coach, Dan Bylsma. Orpik is competing in his second Olympics while it is the first for Martin. He was chosen for the 2010 games but had to bow out due to injury. Martin has worn the red, white and blue four times previously, most recently at the 2008 World Championships when he was named one of the Americans’ ‘Top Three Players’ after collecting eight points (1G-7A) in seven contests. He has also played for Team USA in the 2005 World Championship, the 2004 World Cup of Hockey and the 2001 World Junior Championships. You can join Paul Martin and so many NHL players in supporting Defending the Blue Line.